Well Read is a group exhibition curated by Christopher Howard that explores what it means to “read” in contemporary art and culture. 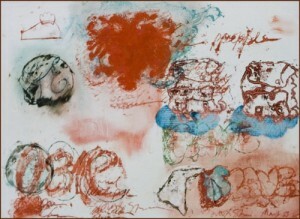 In conjunction with the exhibition, NURTUREart presents a curator’s talk on Saturday, April 15. Two artists deal directly with language, emphasizing the visual forms—real or imaginative—that verbal expression can take. 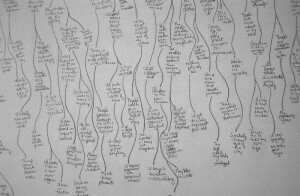 Nicholas Knight diagrams sentences culled from the writings of eminent thinkers, authors, and artists, showing how parts of speech and sentence structure work to create meaning, literally, visually, and philosophically. 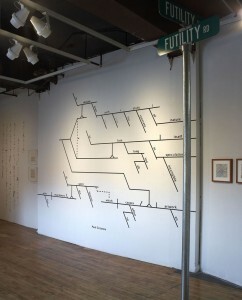 Beth Campbell’s text-based flowchartlike drawings, from her series “My Potential Future Based on Present Circumstances,” begin with an autobiographical scenario and swell into a topsy-turvy web of possible outcomes, from the serious to the absurd. One critic has written, “She makes art out of the way we think”—these drawings could thus be seen as reading her thoughts. Visualizing the mental images of memory and nostalgia, Molly Springfield paints handwritten notes—the kind grade-school students pass during class—often doubling and reversing the words, creating a translucent space that fluctuates between legibility and illegibility. 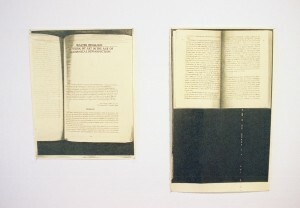 Her meticulous, photorealistic drawings of photocopied pages of art books and literary works juxtapose the permanence of scholarly knowledge with the disposability of the Xerox copy. Cui Fei and Stephanie Brooks use language to explore new aesthetic and conceptual spaces. 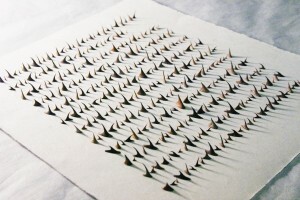 Cui pins dozens of small, dried twigs to the wall; these forms imitate the characters of Chinese calligraphy, which themselves derive from nature. She also glues rose thorns to sheets of paper—love letters that are a perilous yet intensely poetic form of Braille. 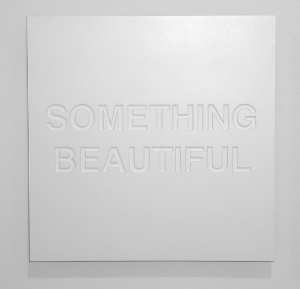 Brooks’s untitled plaques present texts stating, for example, “Something beautiful” and “The best day of my life”—things inadequately represented by words, images, or a combination of the two. For Love Songs, she turns personal letters and published texts into musical notation for sheet music. Vandana Jain reconfigures familiar corporate logos in her “Tangrams” series. 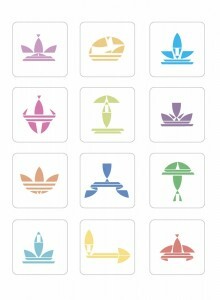 Freed from brand identity and controlling functionality, these symbols playfully resist consumer culture. Gabriel Fowler fabricates sculptural works that resemble ordinary street and commercial signs. 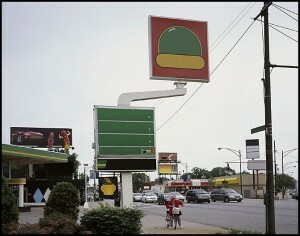 Yet he substitutes those signs’ factual nature for abstract, open-ended, and humorous interpretations. Matt Siber photographs urban street scenes and digitally removes all words and numbers that appear within the frame. He then creates two separate pictures—one of the street scene, the other of the transplanted characters—showing not only how language permeates the contemporary world, but also how the composition of signs, symbols, color, and architecture are laden with signification. Duston Spear’s paintings contain riffs on street graffiti, fragments of writing by Stephen Crane, and enigmatic images of a backpack, which can all be read in terms of the outlaw, criminal, and terrorist, and as an urgent reflection on war. Eschewing narrative storytelling, Heidi Neilson’s artist’s books and postcards explore the role of punctuation—an integral but often overlooked part of written communication—as symbols that express tone and emotion, as well as a sense of closure. 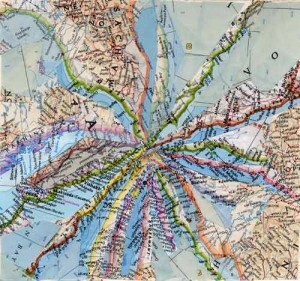 In another body of work, she collages cut-up maps into unusual configurations, allowing the viewer read geography and topography in new ways. Download a PDF of the press release and checklist. Kevin Kraynick, “Last Call for Art,” Free Williamsburg, March 8, 2006. 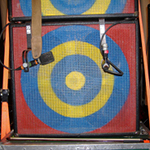 Momus, “My Saturday,“ imomus, May 7, 2006. 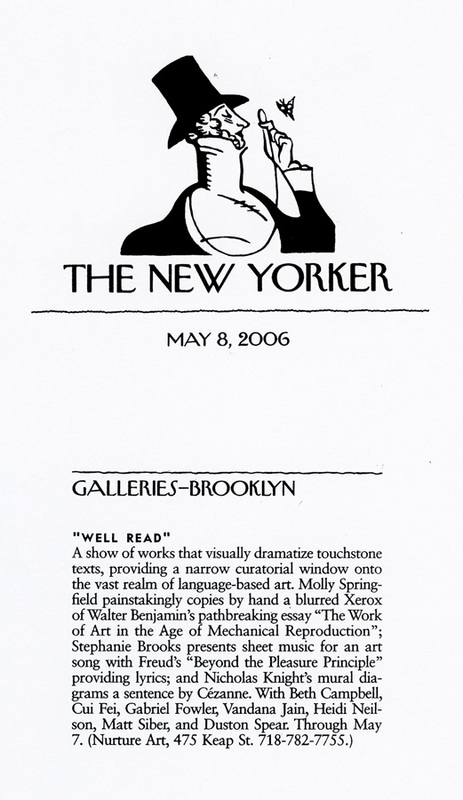 De Selby, “A List of General Observations about Well Read, a Group Exhibition at NURTUREart,” Global Warming Your Cold Heart, July 1, 2006.